Iraqi Prime Minister Nouri Maliki and US officials say two leaders of al-Qaeda in Iraq have been killed in a joint Iraqi-US operation. Mr Maliki said on national TV that the Iraqi al-Qaeda leader Abu Ayyub al-Masri and Abu Omar al-Baghdadi, who led an affiliate group, were dead. US Vice-President Joe Biden said their deaths were "potentially devastating blows" to al-Qaeda in Iraq. Mr Maliki said both had been killed in Salaheddin province, west of Baghdad. Iraqi TV showed pictures of both men before and after their deaths. When the Americans killed the leader of al-Qaeda in Iraq, Abu Musab al-Zarqawi, in 2006, it was described as a massive blow to the insurgency. Yet it raged on unabated. Only a switch of tactics by the Americans the following year, and other developments, reduced it to its current low levels. Assuming the announcement is correct, it has taken four years to track down and kill Zarqawi's successor, known as Abu Hamza al-Muhajir or Abu Ayyub al-Masri. Leaders are clearly important, and eliminating them can have an effect in compounding the decline or hampering the growth of an adversary. But - as Zarqawi's death showed - it is not enough on its own. However, the insurgency has been sharply curbed in the past two years. The death of the two leaders, if confirmed, could help accelerate the downward trend. "The attack was carried out by ground forces which surrounded the house, and also through the use of missiles," Mr Maliki said. He said the house in Thar-Thar had been destroyed and the two bodies were found inside, in a hole in the ground in which they had been hiding. 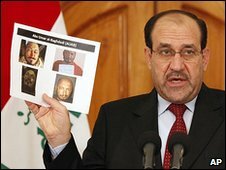 "During the operation computers were seized with e-mails and messages to the two biggest terrorists, Osama bin Laden and [his deputy] Ayman al-Zawahiri," Mr Maliki added. Speaking in Washington, Mr Biden said the operation "demonstrates the improved security, strength and capacity of Iraqi security forces". In a statement, the commander of US forces in Iraq, Gen Raymond Odierno, said: "The death of these terrorists is potentially the most significant blow to al-Qaeda in Iraq since the beginning of the insurgency." The statement said Iraqi forces with US support had mounted a night-time raid on the al-Qaeda leaders' safe-house. It said the men were killed "after engaging the security team" and that al-Masri's assistant along with the son of al-Baghdadi were also killed. A US helicopter crashed during the attack, killing one US soldier, the statement said. There have been several previous official reports that both militants had been captured or killed which have turned out to be untrue. 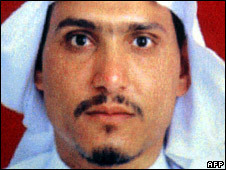 Abu Ayyub al-Masri was also known as Abu Hamza al-Muhajir. He was believed to have helped Abu Musab al-Zarqawi form the first al-Qaeda cell in Baghdad. Zarqawi was killed in June 2006. The Islamic State in Iraq is an umbrella organisation that includes several radical Sunni militant groups. Al-Baghdadi was a nom de guerre for its shadowy leader, although some US commanders had previously cast doubt on whether he even existed. US officials said his real name was Hamid Dawud Muhammad Khalil al Zawi. Mr Maliki said al-Qaeda had tried to camouflage Baghdadi by presenting several people with this name. Al-Qaeda in Iraq has been blamed for some of the bloodiest insurgent attacks in the country since the US-led invasion of 2003. The BBC's Jim Muir in Baghdad says that despite the optimism, the death of Abu Musab al-Zarqawi in 2006 did little to slow the insurgency. The militants' fortunes in Iraq are at a low ebb, he says, and the deaths of its leaders are no doubt a factor in that, but there are many other elements involved too. Since early 2007 the US has adopted a more proactive policy in confronting insurgents in Iraq and undermining their support within the Sunni community. The sectarian strife on which the Sunni insurgents thrived also died away as coalition and Iraqi government forces moved to curb Shia militias, our correspondent adds. Mr Maliki is currently contesting the results of the 7 March election which was narrowly won by former prime minister Iyad Allawi. Election officials have ordered a manual recount of votes cast in Baghdad after complaints from Mr Maliki that the electronic system of counting was unreliable. The recount could alter the final result of the poll.